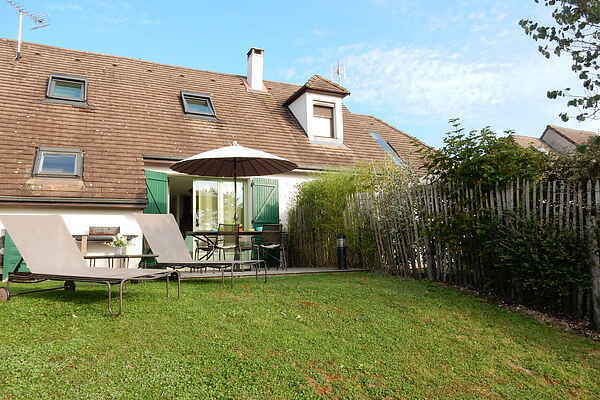 An oasis of peace: that's how you could describe this charming holiday home situated on the recreational lake of Lac de la Forêt d'Orient in the south of the Champagne area. This holiday home offers all the space and comfort you need to spend a lovely time with family or friends. This holiday home has been stylishly furnished in natural colors symbolizing nature, peace, harmony and relaxation. The regional Parc Naturel de la Forêt d'Orient is 70,000 ha in size, with vast woodland and three beautiful lakes. Numerous marked hiking routes crisscross the countryside. The Lac de la Forêt d'Orient is the perfect location for those who enjoy water sports. Surfers, sailors, bicyclists, fishermen and sun lover, everyone will love it here. Bakery and grocery in Mesnil-St. Père (1 km). Take the champagne trail. It will lead you to the smallest, simplest and most romantic villages with lovely old churches and village bistros. Make sure to visit Troyes (22 km), a medieval city where time seems to have stood still. Chaource (34 km), in the south of the Aube, is famous for its soft moulded cheese. Riceys (35 km) is a unique village that comprises three hamlets along the river Laignes. Amusement Park Nigoland is in Bar-sur-Aube (26 km).